Rest with the angels girls. Two weeks back, Sunday afternoon service we had a visiting preacher; an Australian domicile in South Africa’s Cape Town of the famous HillWorship. As part of his presentation ‘under living in the moment’, he gave a recount of the day he was preparing his summon and his twelve year old son stormed into his room. And unusually interrogating, “Dad can we go for an adventure?” Surprised and worried that he’s got a summon to mind, Dad goes “What’s your idea of the adventure son?” The son quips, “I think that’s why it’s an adventure because no one knows until you experience” (congregation laughs) I conclude that kid must be the breed that goes to group of schools. Phill asks “can we take the dogs with us?” The son says yes. The adventure happens. Dad posts a pic of his son and dogs in a hilly escarpment on instagram and captions “some of the times it’s refreshing to take a break from life and go for an adventure with son and dogs” First comment instantly comes from his fifteen year old daughter “and abandon your daughter at home” To a dad that’s like that final jab MacGregor endured in the ninth and closing round of the Mayweather Vs MacGregor affair as he hang boots. The thing with living in the moment (which definitely is those things that give you joy) some people might not necessarily like your idea of happiness. Like the above statements on the school fires might well pass for my idea of living in a moment. Because well, every one got to say something about anything. But wait I want to imagine a majority of you are versed with that first theory that was given in relation to the Moi Girls school fire. About a girl who was constantly disgruntled about the life at school and the school itself and the happenings and the deaf ears that the world gave her and her rants. Well, in that theory, she went ahead to give her shot at living in a moment and chose to put that place a blaze. May be may not it gave her joy. But see the grief it’s caused the world! When I started reading, I discovered that the world is fractured in the mid half. And that everyone you meet is fighting a battle of their own. If they’d chose to write they’d let the world have a glimpse of it. In choosing silence, it doesn’t mean the gods are favorable with them. Reaction visa vis action to internal bleeding might come out in various forms. Today and if you don’t mind good people, I want it goes down as our special Monday of one minute of silence to pay tribute to the fallen nine souls. Because today we are talking about Moi girls fire tragedy. We are penning misery. We are talking distress. We are speaking heartache. We are writing despair. People it’s anguish. It’s agony. It’s sadness. It’s PAIN! Such are not the kinds of stuff you can describe. You don’t want to dwell there! You want to find closure and move on. Think about the nine families. Think about the extended lineage. Think about the bombshell loss. Think about the time they got the sad news that shock the nation. Ponder a little more about their reaction. This is teary terrifying. Think about their fellow students at school. Think about the sudden grief. Think about the trauma of seeing one of your own burn to ashes. Think about the efforts they put in as they battled the fires. Think about how they will think when they think about their fallen colleagues and how it will remain like a dark cloud forever. That’s harrowing. 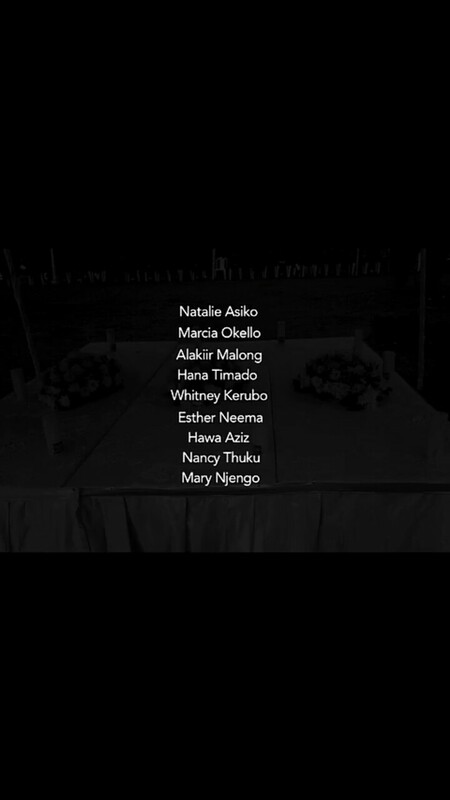 Think about the nine girls who are no more! Their ambition; dead cut mid way. Their young promising lives; now no more! Their education, the same they had come to pursue as they met their freaking fate! What could it be that lay in their way? Rest with the angels girls. Think about the lose. The girls. The lives. Their relatives. Then the school and the closure they need. I mean no one ever gets words enough to talk about misery, distress, heartache, despair, anguish, agony, sadness, PAIN!